Here I am. Sitting in front of my computer trying to come up with the best idea to use for my first article on my shiny new website. Boy do I hate writer’s block. Wait a minute…First article for a column about video games…..First article for the site….I know! I should write about bunnies! On second thought, that might be a bad idea. I think I’ll settle for something else. Let’s try a list of some video game firsts. That sounds simple enough. Guess a good place to start would be right at the beginning. So without further adieu…. Cathode Ray Tube Amusement Device – Created by Thomas T. Goldsmith Jr. and Estle Ray Mann, this game was basically what the name describes. 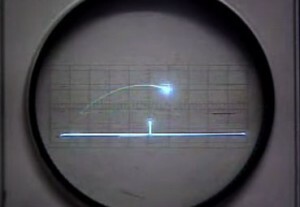 An interactive electronic game played on a cathode ray tube (CRT). Drawing inspiration from radar displays used in World War II, this device used analog circuitry to control a CRT beam to position a dot on screen. Since all you could get was a dot, screen overlays were used to display targets. Not much else is known about it due to it being only seen through a patent given in 1948. Tennis for Two – William Higinbotham one day decided to spice up the tours done at the Brookhaven National Laboratory. So he took one of the computers used to calculate ballistic missile trajectories and made a game that had nothing to do with missiles. Using an oscilloscope as a display, showing a court, net and ball, and an analog knob and button for control. Chase – Ralph Baer (a name that you will see often in gaming history) had the idea of interactive television. After 2 months of work he created Chase. All the game consisted of was two dots chasing each other but it was enough to convince his employer, Sanders Associates (a military defense contractor), that he was on to something. They then put Baer in charge of a team to research and develop other things based on this idea. Galaxy Game – Programmed by Bill Pitts and Hugh Tuck, this game was installed at the Tresidder Union at Stanford University. Costing 10 cents a game, the game was popular enough to have players wait for around an hour to play. Magnavox Odyssey – Starting life known as “The Brown Box”, the console was the result of the team at Sanders Associates lead by Ralph Baer. Using electrical jumpers players were able to play 9 games that was hardwired into the system. This console also spawned the first light gun. Of course these are only a few of the firsts in video gaming. Keep an eye out for the next installment of Gaming Greats as we explore more firsts. This is it! The cumlination of weeks of hard work and dedication. ExplicitNerdity.com aims to be a great site for people to come and share in many topics that nerds and geek hold dear. This site will continue to grow with many new blog topics and our weekly podcast that is soon to come. So stay tuned!